Welcome to the 2019 Nielsen Men’s Pro Tennis Championship in Winnetka, Illinois. This ATP 80 challenger event begins on Monday, July 8th with matches through Sunday, July 14th. The ATP has initiated several changes to our format this year, including the elimination of qualifying weekend, a main draw of 48 players (including 16 byes) and Finals on Sunday. This one of a kind event attracts some of the finest tennis players in the world drawing local, national, and international attention. Past players include current top 10 stars Kevin Anderson and John Isner, along with Jack Sock, Sam Querrey, James Blake and Pete Sampras got his start in Winnetka! 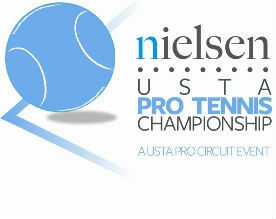 We invite you to come out with your family and friends to experience the event for yourself, or consider partnering with the Nielsen Pro Tennis Championship as a valued sponsor. Net proceeds from this event benefit the North Suburban Special Recreation Association (NSSRA). All matches will be held outdoors at the A.C. Nielsen Tennis Center, 530 Hibbard Rd. Winnetka, Illinois 60093. For information about volunteering, ticket sales, ball kid tryouts, players, draws and match schedules please continue to check our website. We will update the site as we have information.